TRAILER: Star Wars: The Rise Of Skywalker - Joe.My.God. The final installment of the Star Wars sequel trilogy finally has a name. 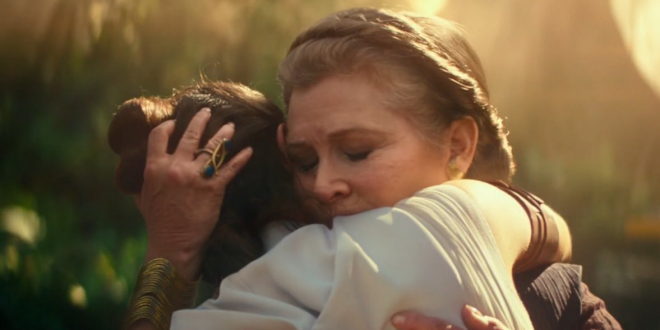 During a panel at Star Wars Celebration today, Lucasfilm debuted the first trailer for Episode IX, which will officially be called Star Wars: The Rise of Skywalker. The film will be directed by J.J. Abrams, who kicked off Disney’s Star Wars efforts with The Force Awakens back in 2015. According to Abrams, the new installment takes place sometime after Rian Johnson’s The Last Jedi. Featuring an all-star cast that sees the return of Mark Hamill and the dearly-missed Carrie Fisher as Luke Skywalker and General Leia Organa, as well as the long-awaited return of Billy Dee Williams as Lando Calrissian, Star Wars: The Rise of Skywalker will bring an end to the story of the Skywalker family, as the last of the Resistance—including Rey (Daisy Ridley), Poe (Oscar Isaac), Finn (John Boyega), and Rose (Kelly Marie Tran)—goes into battle to free the galaxy from the tyrannical grip of the First Order and its new Supreme Leader, Kylo Ren (Adam Driver). Disney CEO Bob Iger on Thursday said the lucrative “Star Wars” film franchise will go on a “bit of a hiatus” after the upcoming conclusion of its latest trilogy. The latest “Star Wars” trilogy has had massive success at the box office. “The Force Awakens” earned strong reviews and grossed more than $2 billion worldwide in 2015, while “The Last Jedi” generated more than $1.3 billion. However, Disney’s attempts at “Star Wars” spin-off films have been less successful.